Even though our family trip to Hawaii this year was virtually a mirror image of the trip my husband and I took just last year, we wanted to make sure to add in a few new things this year so it didn’t feel like we were taking the exact same trip. There were some things we wanted to do last year that we never got around to, so this was the perfect opportunity. After all, how often do you find yourselves in Hawaii? Ok, so maybe after last year my husband and I figured that it would probably be a good 5-10 years before we went back to Hawaii again. And we never anticipated that we’d get the opportunity to go back again so soon. But, hey, that’s an anomaly, right? Unless we somehow find ourselves back again next year. Part of changing things up, means finding new and interesting places to eat. Food, after all, is a big part of traveling for my husband and I and is something we find to be really memorable when we return home. So, about a month before we left for Hawaii my husband sent me a text message with the name of a restaurant and told me to check it out because he really wanted to go there. After I saw the restaurant’s menu, I was in agreement that we should give this place a try. It was located not too many miles from our hotel on the Big Island and had a great reputation. Also, it’s something a little different from what you’d think you’d go to Hawaii to eat. It’s not your average sushi, Asian-fusion, loco moco, fresh fruit, seafood joint. Annie’s Island Fresh Burgers has a reputation as being of serving up the best hamburgers in Hawaii. Now, I know hamburgers aren’t the first food item I think of when I think of Hawaii. In fact, burgers are probably the last type of food I think of traveling to Hawaii to sample. But it’s so far out there, it sounded intriguing to see just how great these burgers could possibly be. This is actually how my husband found out about Annie’s Island Fresh Burgers, he saw an article online highlighting the best burger joints in each of the 50 states, and Annie’s was referenced for Hawaii. When my husband realized that we’d only be staying a few miles away from their location in Captain Cook, just south of Kailua-Kona on the Big Island, he really wanted to check it out. 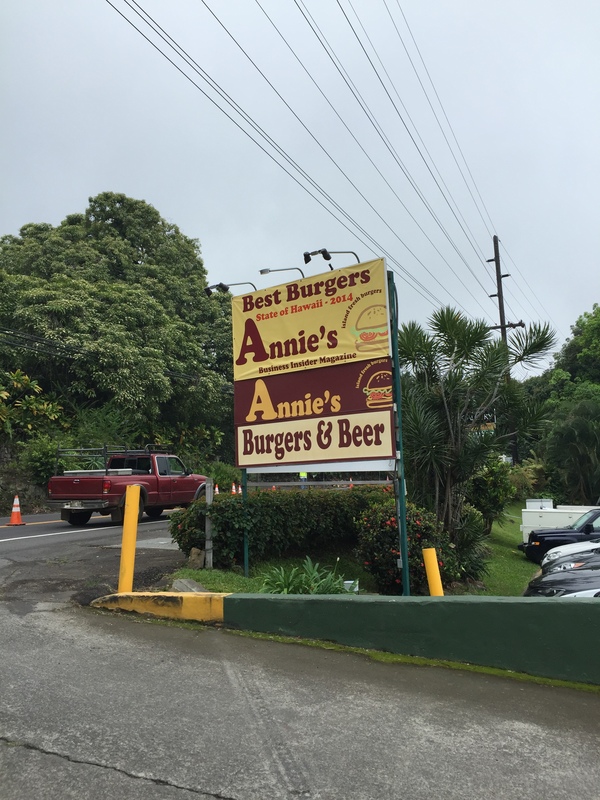 In fact, when we stepped into the restaurant, there was a printout of an article from Business Insider magazine that highlighted that Annie’s Island Fresh Burgers had been named the best burgers in West Hawaii for 3 years running. 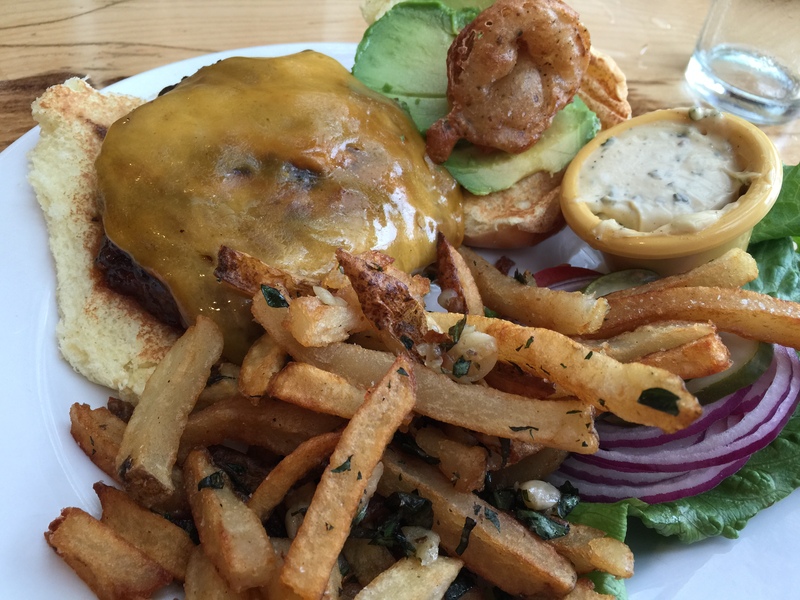 Annie’s says that what distinguishes them apart from others is their commitment to using fresh, local and organic produce and grass-fed, island raised beef for their burgers which they make to order to each diners preferred done-ness. Their website says that they “offer organic creative dishes that reflect the quality of Hawaii-grown food.” Everyone loves a good burger, don’t they? Time to find out of Annie’s burgers live up to their reputation. When we arrived at Annie’s, just before noon on a weekday, we found that the restaurant was already hopping. In fact, our party of 6 had to wait a few minutes before we could even be seated at a table. The morning had brought tropical rain to the usually dry side of the island so the skies were a bit overcast, but that did nothing to cut down on the humidity and warm temperatures. After perusing through the drink menu, my husband and I both decided to order a drink called the lilikoi spritzer. The menu listed the drink as being a seasonal item, so we were lucky that it was in season when we were at Annie’s. I’m not exactly sure what was in the drink, though I’m assuming it’s lilikoi, better known as passion fruit, puree and club soda or tonic water, the drink was so incredibly refreshing. A bit bubbly and carbonated the lilikoi puree gave the drink a bit of sweetness as well as a bit of tartness and tang from the fruit itself. 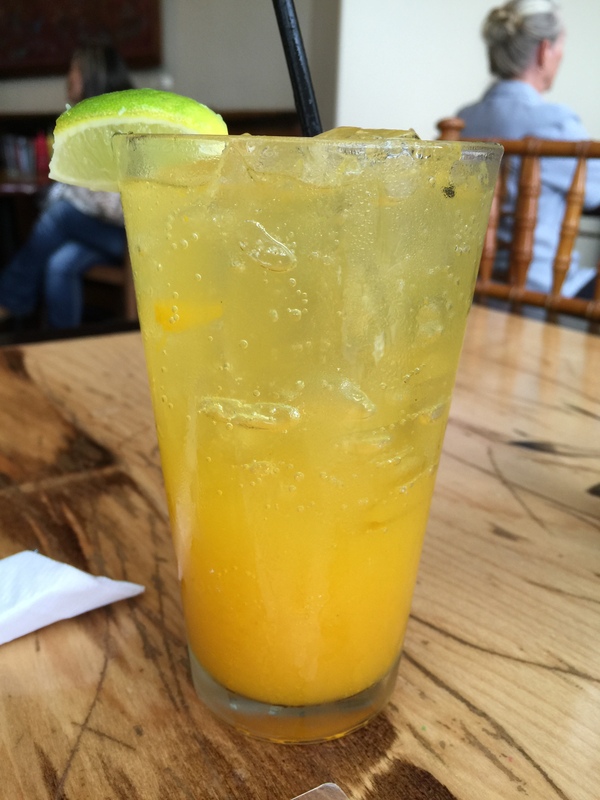 It was the perfect drink to sit back and relax with on such muggy day. The drink was a perfect compliment to the tropical island setting. After all, you just can’t go wrong with lilikoi-anything when in Hawaii. For the table, we ordered a basket of the sweet tempura onion rings to start off our meal. The basket was brought to the table piping hot right out of the fryer. Annie’s isn’t kidding when they say that everything is made to order. The sweet onion, which Hawaii is well known for, was quite evident in these onion rings. The flavor of the sweet onions was terrific and really shined through past the batter and all of the seasonings in the batter. The other thing that was evident was how perfectly these onion rings were cooked. The onions were tender and juicy inside and the rings were perfectly fried with just the right amount of golden brown crispiness without burning the onion rings. My mother-in-law loved the tempura batter on the onions, I was not as thrilled with them. Different tastes for different people, I guess. I liked that there was definitely the addition of coarse black pepper in the batter, you could see it in the onion ring itself. However, I thought that there was too much black pepper in the batter and the strength of that black pepper started to overpower the sweetness of the onion and was just a bit too strong. I’m sure that the reasoning behind the black pepper was to balance out the sweetness, but I think it was just a hint too much black pepper. And you’ve got to understand that I love black pepper an I use it generously, but even for me, this was too much. My mother-in-law, she loved the addition of black pepper in the batter and was of the opinion that the black pepper in the batter really added to the flavor of the onion ring and was a genius addition. 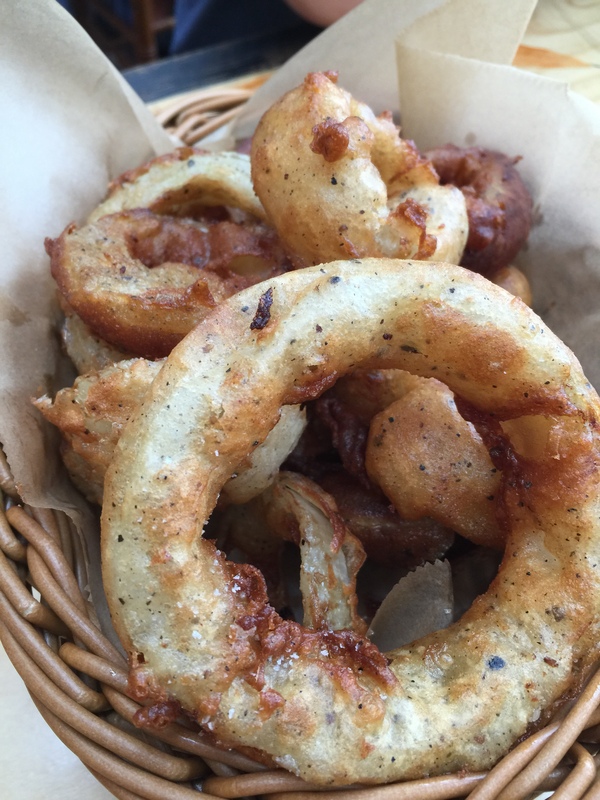 What we did agree on was that the tempura batter for the onions gave the rings great crunch and the batter was so light and airy that the onion rings didn’t feel heavy. While the menu at Annie’s Island Fresh Burgers included more than just burgers, how could you come to a joint known for their burgers and order a salad or fish or chicken instead? All of us at the table ended up ordering burgers. Funny thing is, my sister-in-law and her husband both ordered the same burger, my mother-in-law and father-in-law both ordered the same burger, and my husband and I actually ordered different burgers, both of which were different from the burgers ordered by anyone else at the table. I guess we don’t like being the same. The menu indicated that all burgers and sandwiches at Annie’s included the following items: local vine-ripe tomatoes, organic lettuce, housemade pickles, and red onions. Of course, all of the burgers were made with grass-fed, Big Island raised beef. And each order came with a side of hand cut fries, housemade creamy cole slaw or purple potato salad. Additionally, Annie’s served something called garlic basil fries, which you could upgrade to in place of any of the other sides. 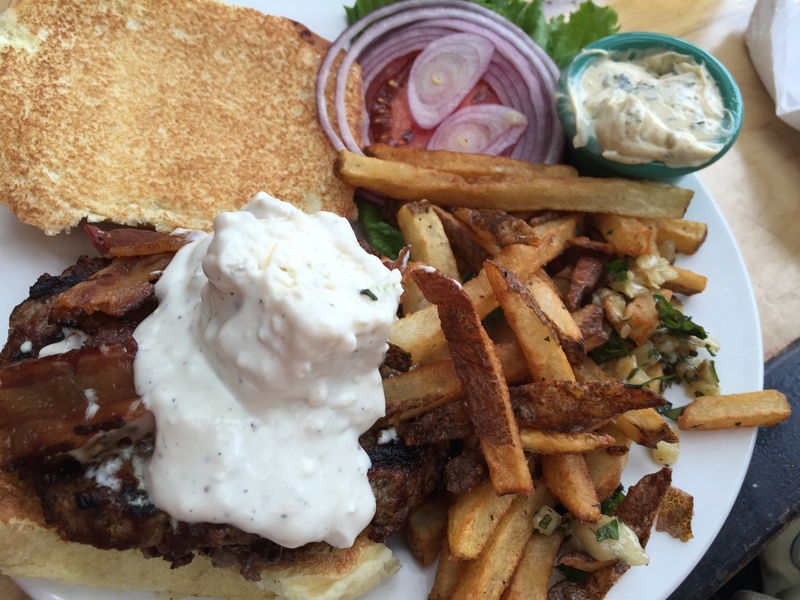 My husband ordered the bacon bleu burger made with juicy island raised beef smothered with Annie’s creamy garlic bleu cheese sauce. The burger came with thick bacon and served on a toasted traditional bun. My husband chose the upgrade to garlic basil fries as his side, which come with a small side of garlic aioli as a dipping sauce, or what my husband told me they called Hawaiian aioli. I was shocked by the amount of garlic bleu cheese sauce on the burger when it was served at the table. It literally looked like an ice cream scoop’s worth of sauce and I was afraid that it would be too strong for the burger. After all, garlic and bleu cheese are both really strong flavors. However, my husband said that the burger was perfect. The sauce was tasty and wasn’t too strong or overpowering at all. He loved the grilled char flavor of the patty and how that added such great flavor to the burger itself. Also, the garlic basil fries were a winner. They were actually made with fresh, minced garlic, which was a surprise to us all, but which added incredibly flavor to the fries. And the Hawaiian aioli was fantastic. My brother-in-law used the aioli for both his burger as well as his fries and had to ask for more of the aioli because it was that fantastic. I ordered the BBQ “South Point” burger which was made with delicious island beef glazed with Annie’s southern-most island-style BBQ sauce. The burger was topped with avocado, cheddar cheese, and a crispy onion ring. What I noticed right away when I took my first bite of the burger was how amazing the beef truly was. Normally, I don’t notice the beef itself when I eat burgers, just because beef is beef and it all tastes the same. However, at Annie’s there really is something to their sticking with grass-fed Island raised beef. The flavor of the meat was incredible and it tasted fresh and juicy and delicious. The fresh sliced avocado gave the burger creaminess and a cooling effect to the island-style BBQ sauce on the burger which was both a bit sweet and a hint of a bit of heat. Using local, vine-ripe tomatoes is a big deal as we found out later on during the trip when we dined at a different restaurant. Apparently, there’s such a desire for tomatoes that most places need to import their beefsteak tomatoes from the mainland as demand can’t keep up with the supply of tomatoes grown on the Island. So having local tomatoes served with each burger is a bit of a treat and shows a real commitment to providing fresh, organic and local ingredients in each burger and sandwich. This was definitely one memorable burger as all of the components of it really came together. And again, the garlic basil fries were terrific. Who knew? They’re savory flavoring and hot potato goodness with the terrific garlic aioli was a great combination. To finish off our meal, my husband and I decided to split a “dessert.” I use the term loosely because while it’s technically a dessert, it’s not really a dessert. On this warm, muggy and drizzly day, my husband and I wanted something cool and refreshing so we decided to split a root beer float. 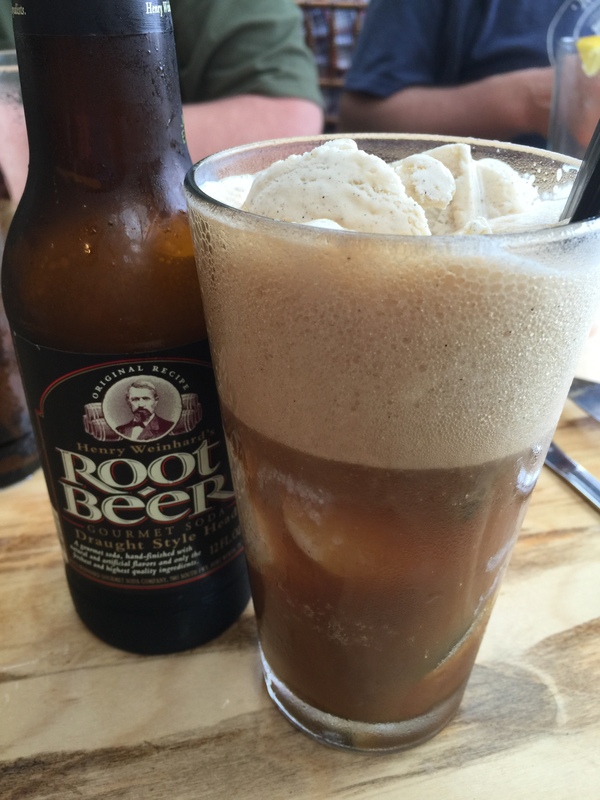 Made using a bottle of ice cold root beer poured over a couple of scoops of Tropical Dreams vanilla ice cream, the frothy, creamy dessert was a perfect ending. Sticking to the idea of serving local ingredients, Tropical Dreams is a Hilo-based, Big Island ice cream, sorbet and gelato maker that has been serving “super premium” ice cream for over 20 years. Ice cold root beer over ice cream that was sweet, rich and creamy was really delicious and created a combination that was perfect for this setting and this weather. It’s not hard to see why Annie’s Island Fresh Burgers has been named the best burgers in the State of Hawaii. A couple of days later when my husband and I were spending the day with his parents on the other side of the island, we still found ourselves talking about Annie’s and how terrific our burgers were. I think we all agreed that it was the beef that really stood out in Annie’s burgers and really made all of the difference. The fresh flavors, the fresh ingredients combined with some of the unique flavor combinations that they put atop their burgers, Annie’s Island Fresh Burgers really is something to write home about and one of the more memorable meals from our trip to Hawaii that I’ll bring back with me. A burger is just a burger is something that you won’t catch yourself saying after you’ve dined at this local neighborhood joint in Captain Cook because Annie’s burgers have that little extra something that takes it a step above all other burgers. I think we all enjoyed having lunch here. I didn’t remember that I ordered the same thing as Greg and that actually seems very odd to me because we usually don’t have the same taste in burgers (or much else…) I don’t remember what I had, but it was good. And the inside of that place was casual and fun and I liked it. Yes, you’re right! I remember now! That was really good. And it does sound like the rare burger we would both order.